The Abbot-Downing Historical Society will be a recognized force in the preservation and education about the role of the Concord Coach in American history. Abbot-Downing Company. 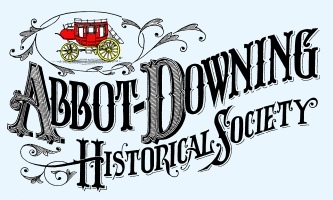 Its purpose is to collect and maintain vehicles, papers, pictures, tools, and other memorabilia relating to the Abbot-Downing Company and other manufacturers of horse drawn vehicles. (2) Through publications, exhibits, and other programs to educate and involve the public in the techniques of horse drawn vehicle operation and the role of these vehicles in the development of the the United States. The mission of the Abbot-Downing Historical Society is to educate people about the significance of the Concord Coach and its relationship to our history and lives today. To support this mission, the society collects, preserves and interprets materials related to the Concord Coach and Abbot-Downing Company and its role in American transportation.